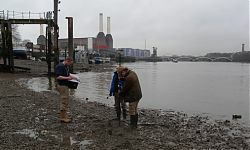 In January 2009, the TDP and Museum of London Archaeology, working with Ove Arup and Partners Ltd (Arup), discovered an Anglo-Saxon fishtrap at Thames Wharf in Hammersmith. 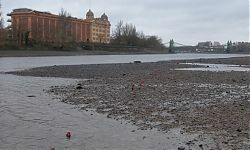 The structure, which is similar in form to a number of others found during the 1990s, was recorded during a survey undertaken on the foreshore in advance of riverside wall refurbishment by the Environment Agency. Two samples were taken for radiocarbon dating, and the results have shown that the structure dates to the early Anglo-Saxon period (cal AD 420-591). This is a particularly interesting result as it adds further information to the story of early Anglo-Saxon Hammersmith and the immediate vicinity: archaeological excavation just upstream at Hammersmith Embankment revealed an early Anglo-Saxon settlement site, while the remains of a fishtrap, with calibrated radiocarbon dates of AD 430–670, have been recorded on the Surrey shore at Barn Elms, almost opposite the site. A spearhead, a scramasax and a knife recovered from the Thames at Hammersmith also indicate Saxon activity in the locality. 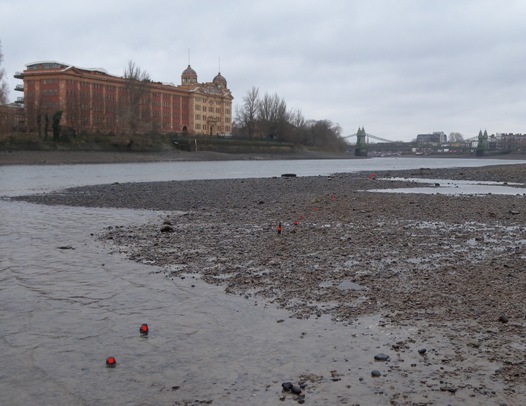 However, the fishtrap at Hammersmith is the second structure in as many months to provide an early medieval date! 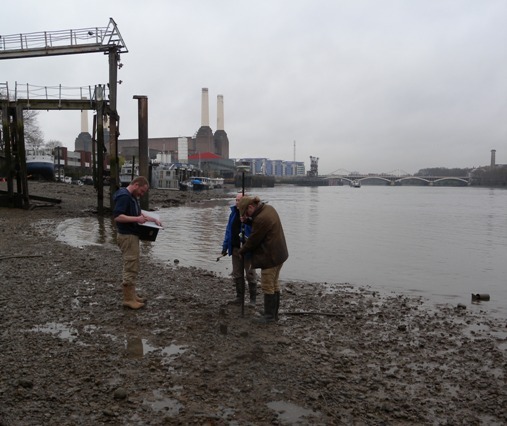 During fieldwork at Nine Elms near Vauxhall, Andy Hawkins, from the Thames Explorer Trust, spotted a line of paired wooden posts which also turned out to represent the remains of an early Anglo-Saxon fishtrap (cal AD 550–670). The structure was sampled and recorded by the TDP and the Geomatics team at Museum of London Archaeology, and many thanks are due to English Heritage for their support in dating the samples – along with many others throughout the lifetime of the project. 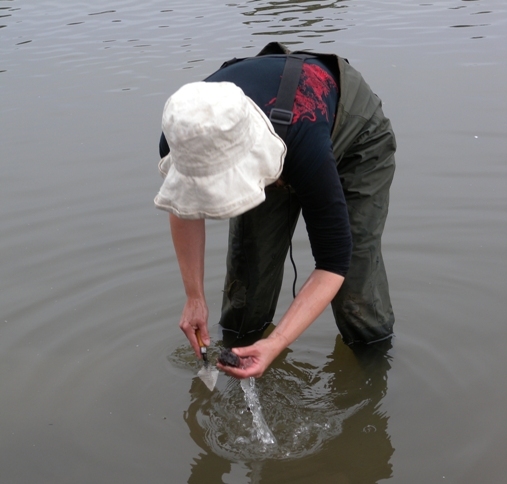 Sampling the possible fish trap at Kew. During the recent fieldwork at Kew with the Richmond Archaeological Society we have sampled another possible fishtrap structure (not without some difficulty!) and we look forward to reporting on the results of this sampling in the future. For more information about fishtraps, check out the Foreshore Fact Sheet and Riverpedia article.